A number of stars have paid tribute to the 29 coal miners killed in an explosion in New Zealand last week. 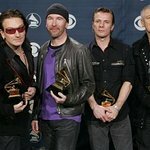 U2 led the tributes by scrolling the names of the dead from the Pike River disaster across big screens while performing One Tree Hill – a song written by Bono in memory of a New Zealand friend – during the band’s two concerts in Auckland. Earlier in the evening, opening act Jay-Z dedicated “Young Forever” to the victims of the tragedy. Meanwhile, Tiger Woods' caddie Steve Williams raised $16,000 for families of the victims by organizing a race car event in the area where the disaster occurred. The All Blacks New Zealand rugby team also honored the dead in their match against Wales in the weekend by wearing white armbands – with the two teams raising thousands of dollars for families – while Australian and English cricketers stood in silence before the first Ashes test. Emirates Team New Zealand – the country’s America’s Cup team – also paid tribute to the dead. The 29 miners were trapped underground for 6 days before a second explosion took all hope of survival away – leaving at least 13 children without fathers. Information about donating to the funds set up to support the miners’ families can be found here.